Megaplex Madness: Now Playing ™ is rated 3.3 out of 5 by 11. Rated 5 out of 5 by chersbldhnd from I play this all the time I really enjoy this game. Very creative quirks in the characters. Wish there was more opportunity to do swaps. Worked through the levels too fast-not because of lack of challenge, but because there were too few levels. Rated 5 out of 5 by writer3 from So much FUN!!! I was gonna skip to the second installment of this game because it received better ratings, but I'm glad I gave part one a try. This game is a lot of fun. It's addictive, cute, has a cool storyline, and I too am enjoying the ragdoll likeness of the customers when picking them up. I'm glad I have part two to look forward to, which should be even better, after I"m done with the first one. I hope they make a third!!! Rated 5 out of 5 by Vanipain from so good Again I am playing this game, because it is so good. I find the idea to make games into the game really great. I am still waiting for a part three of this game. I saw that the first part of the game got not so good reviews, but the second part is well appreciated. I find them both great and hope I will soon have the chance to play part three. Big fish, do it! Rated 5 out of 5 by JamieGameGirl from Classic Cute game with a decent story line of saving classic theaters from being torn down. Nice twist on Time Management games where there isn't a character you need to move around all the time. You control everything by dragging customers around. Which have a cute ragdoll effect. But above all worth a buy because it has so much re-playability. Tons of levels and it becomes a good challenge near the end which I liked. Rated 4 out of 5 by KeithS from A Different Take in the Time Management Genre! I like this game, for the most part. The graphics/art is very apealing. The gameplay and rules are solid. The game itself, at least from my experience, is an original take with the management/upgrading of a theater. My only real issues with the game lie in two places. Some of the later levels, the fun versus frustration level seems pretty high, to the point it is no longer fun, at least for me, to try to achieve the goals. I also was not a fan of how the Arcade piece of this game worked, but that could just be because of the programmers/designers execution of this addition. Rated 3 out of 5 by JibbyEllison from Megaplex Madness??? 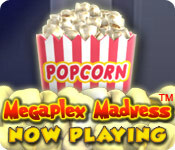 Megaplex Madness is a game where you take on a run down cinema and make it into cinema paradise. You serve customers by giving them tickets, serving them food and drinks, letting them play on arcade games or taking them to the toilet. Also you can buy upgrades, to make things run more smoothly. Every level gets harder; which makes the game have more interest, however the game is repetitive and just goes on and on. I found this game fun but really, really basic. The graphics were plain and was only primary colours, however the music was annoying. I would recommened this game to children but I wouldn't recommmened this game to anyone else. Rated 3 out of 5 by artchixx from Fun but Frustrating at times There's something about the balance of a game that is such a thin line. For me, I like my games to not only run smoothly (not lock up or drag), have a cute plot, eye catching graphics & be challenging. I don't want to race through a game I've purchased, but I'm not too keen of getting stuck on levels that are near impossible to achieve the expert/master finish. Everyone want to get through the game but the extra fun lies in being able to be the best of every level...and when you have to play more than one normally would on all other Big Fish Games - it goes beyond challenge & into frustration. Also, I have to agree with the other reviewer - the arcade was a really cute addition, but some of the games didn't work properly in the arcade. 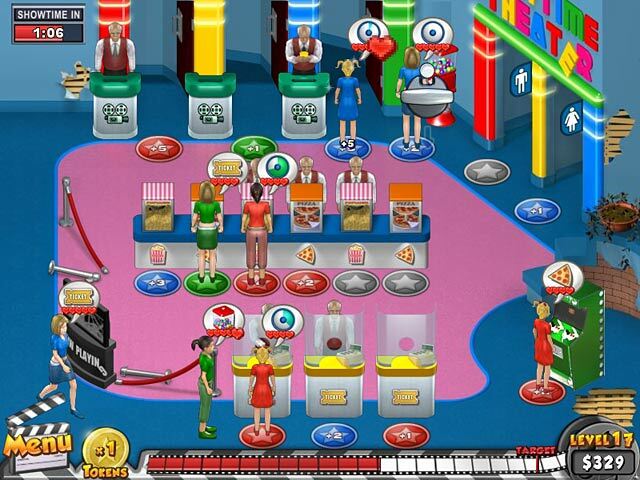 The player plays in the arcade to earn extra money to purchase things to hep get through these difficult levels. 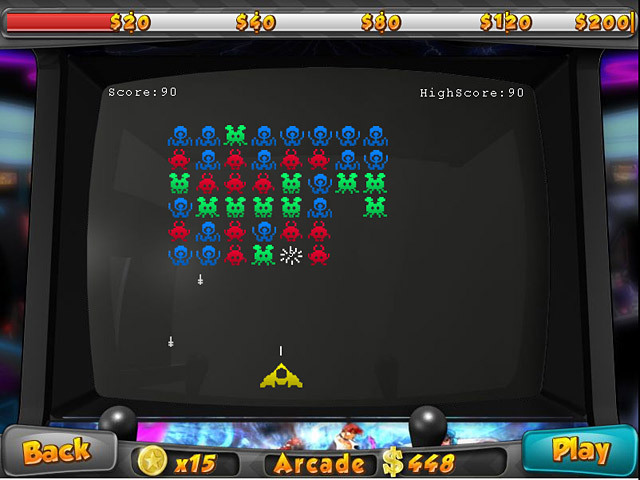 If you can't earn that money in the arcade - then the levels are next to impossible to master - to the full extent. I want to like this game - I really do, but on day 3 of playing it - I find myself getting frustrated & switching games...instead of playing into the night because although challenged - I'm loving it! But, thank you Big Fish Games for having something more than "found object" games! Rated 2 out of 5 by coco_cacao from Disappointed The biggest issue I have is with the Arcade part of this game. The games are either boring or impossible to do. They are retro arcade games and I hated them back then when they first came out. The movie part of the game is okay but also boring. I recommend this game if you enjoy doing retro arcade games. I did the trial version but the hour wasn't long enough for me to realize that I wouldn't like the game. I like time management games but this one was a poor choice; I regret having wasted my money. Rated 2 out of 5 by Handsomeme from Never made it past level 9! A very repeating game, with doing the same thing over and over, only do it faster. I wouldn't say this is a game to play, as you place the people in various places, and it goes faster and faster. I believe it has 50 levels, and I only made it to level nine, after which I had enough. I really did try for a long time, but it got so frustrating that I gave up. I would recommend you try it before you buy it. Rated 1 out of 5 by QueenChancy from Boring and annoying TM game I love TM games, but I found this one so boring and annoying that I didn't even finish my 1 hour free trial. You are tasked to bring back a bunch of old and in ruin movie theaters. 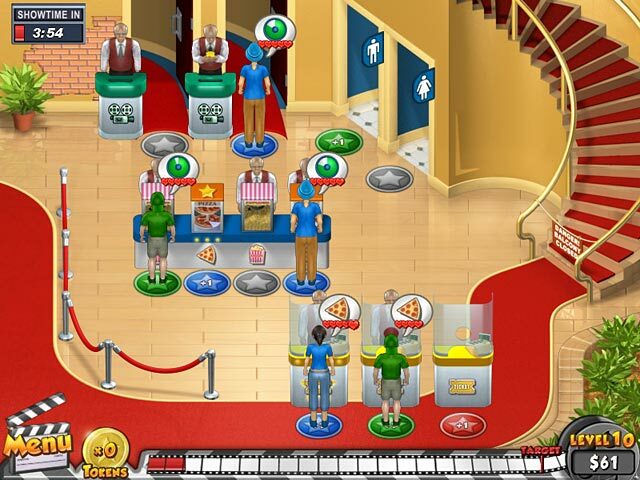 You pick up and put characters at stations for tickets, food, restrooms, arcade and entrance to the movie. There is color coding which helps earn coins and more money. They have an arcade full of mini games that are suppose to help earn extra money for upgrades. Things I didn't like about game: ----It was apparent early on that earning money for upgrades was going to be hard. You had to pay to replay levels. The one arcade game I played paid well on first try, but on replays cash amounts dropped drastically. Also the cost for stations and upgrades were high compared to what you earned in game. I ---Couldn't click on coins to grab them. Could only get coins by dropping people on them, so many coins left on screen. ---People came in slowly but got impatient fast. ---Early on 3 different colors - red, blue and green - with the exception of the ticket stations you are not given a chance to buy more than 2 stations which makes color coding more difficult and in my opinion takes away from the fun.